Dog Breed Memorial Urns ~ the perfect way to remember those special dogs we have had in our lives. 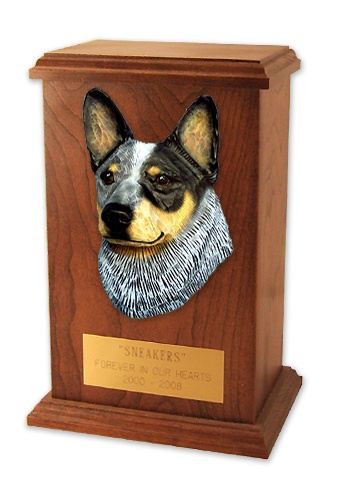 These tasteful dog pet memorial urns are designed to contain the ashes of those dear, dear departed loved ones. The urns are hard-wood rectangular boxes with a routed edge. The urns are spacious enough to hold large dog ashes. Our dog breed urns are available in Light or Dark Oak. Includes a blank 1 1/2" x 4" brass plate for engraving. (Engraving not included). Mounting tape is supplied for the brass plate. The breed dog head is resin - cast from an original hand carved piece. The dog heads are hand painted. Dimensions of box - 4 1/2 in x 6 3/8 in x 10 1/2 in. Custom made upon order - please allow 3 weeks.